I can’t believe fall is already here. Time is passing so quickly that I’ve already gotten a start on my autumn bucket list. I am really looking forward to sharing some of the items I’ve been ticking off the list with you, but first: the list! What’s on your bucket list for the fall? I’ve always wanted to go apple picking. 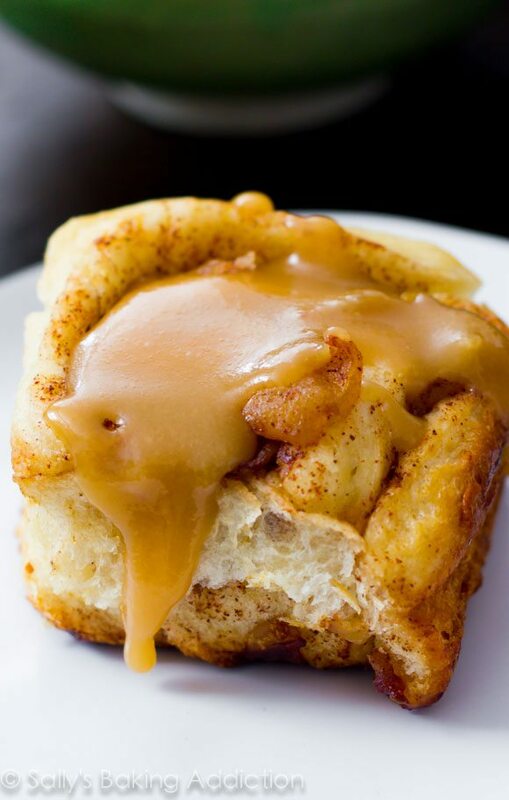 I hear about Crane’s in Fennville and I’m filled with envy over all the people who go there to pick apples, eat delicious baked goods, and wash it all down with apple cider. I would make apple picking more of a priority except every year I can get as many apples as I want for free. And they come to me. There is a very wonderful woman who brings big bucketsful of apples to me and my coworkers every year. She picks apples, way more than she can use, and we reap the benefits of her generosity. It’s a pretty sweet deal. But what do you do when you have an almost unlimited supply of apples? Sure, you can make apple pie after apple pie, but what happens when apple pie loses it’s appeal? 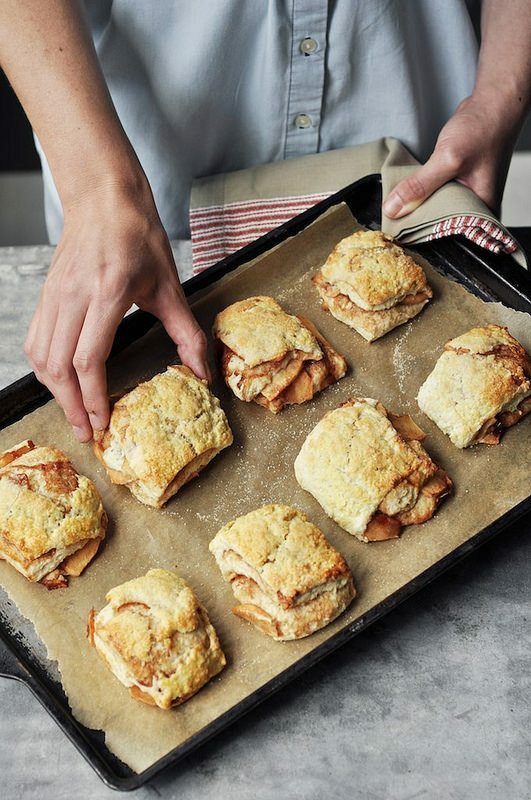 You scour the web (or just Pinterest) for new apple recipes. So, without further ado, here’s five apple recipes you might want to take a look at if you’re like me and have more apples than you know what to do with. 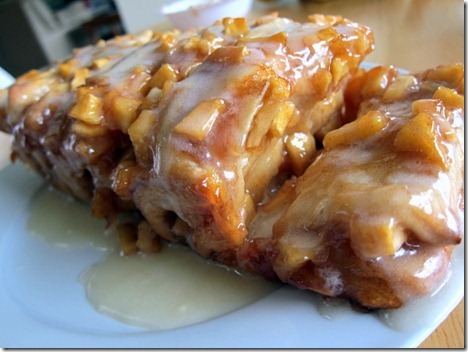 Apple fritters are my favorite donut and yet I’ve never made this bread. I might have to make it a priority this year. I made these the other day. 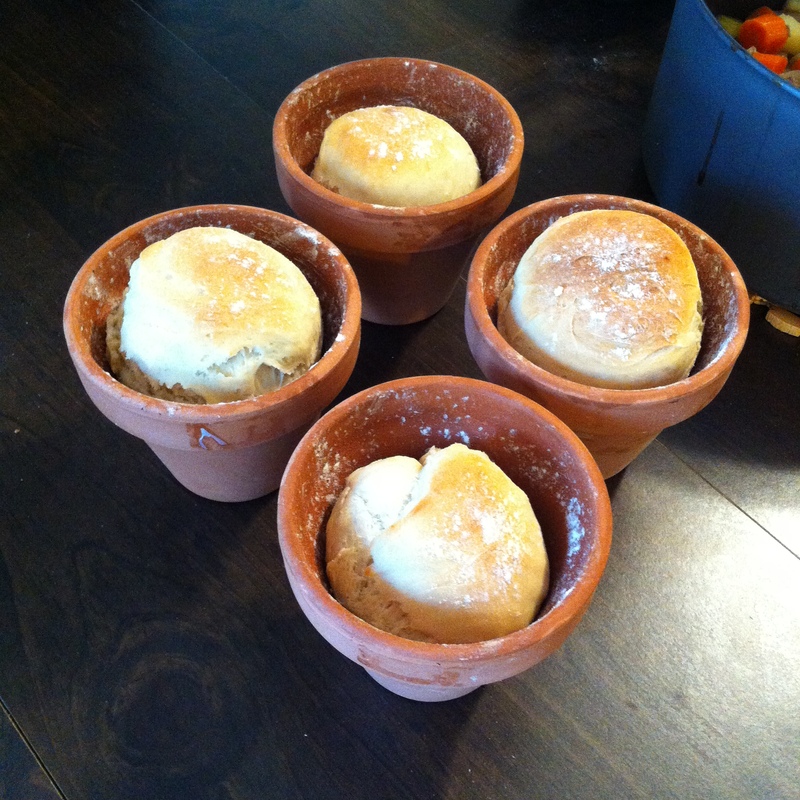 I’ll admit, I didn’t roll out the dough enough so the biscuits were pretty doughy. Not really a success, but the filling was amazing! 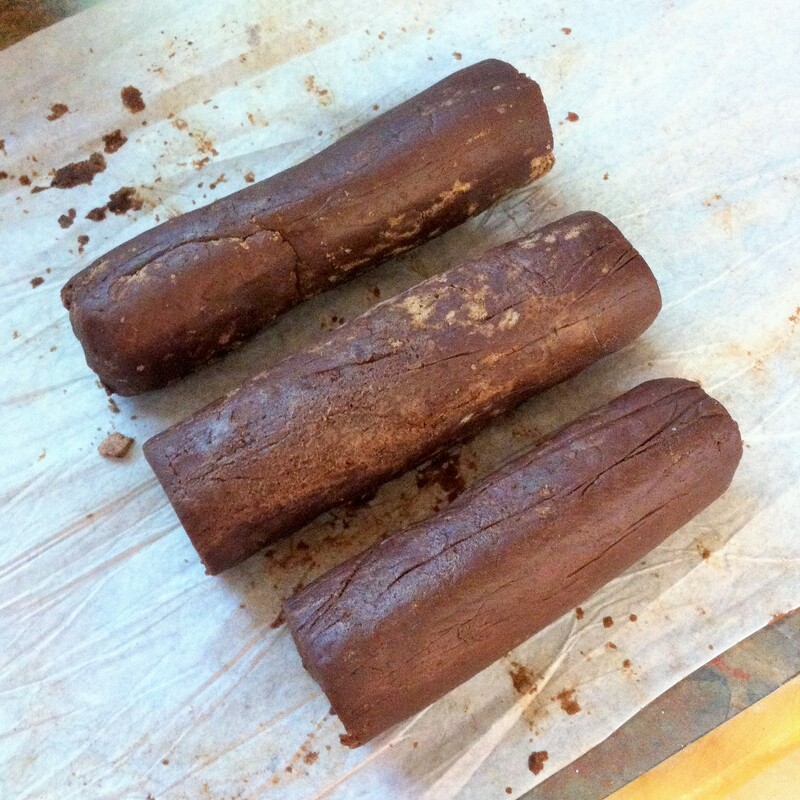 I’m definitely going to try making these again very soon. I love Sally’s Baking Addiction. Every time I google a recipe Sally’s already made it and then took it to the next level. I made a deal with my boss at the library that I would bring in these cinnamon rolls if he bought Sally’s new cookbook. The cinnamon rolls were a hit and now anyone can come check out the Sally’s Baking Addiction cookbook when they come to the library. 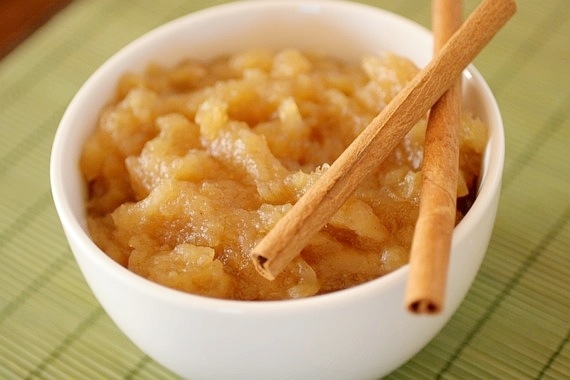 Making applesauce from scratch is super easy. All you have to do is chop up apples and throw them in a pan with a little water, white or brown sugar, and some cinnamon, then you cook it down until it’s the consistency you want. Thick, thin, smooth or chunky applesauce, the results are totally up to you and your preferences. And there’s nothing like the smell of homemade applesauce simmering on the stove on a crisp fall day. 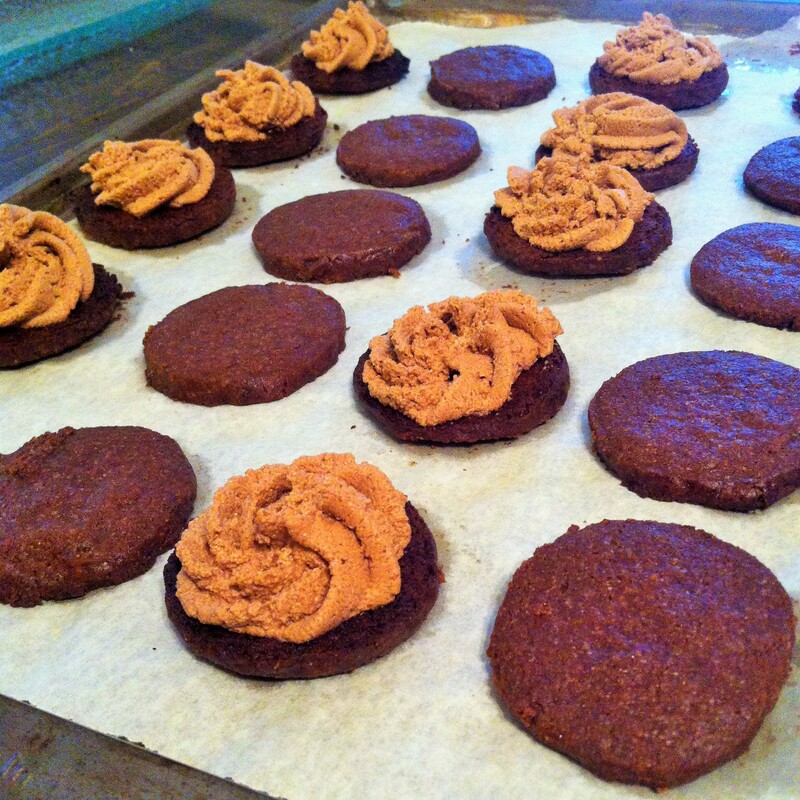 Here’s a healthier treat to make with apples. Dried fruit is awesome. It’s such an easy snack that doesn’t have any added sugar so you don’t have to feel bad about eating a lot at one time, which is what I would do/have done. What do you like to make with apples? Do you have a favorite recipe that you make over and over? Remember these watermelon rind pickles? 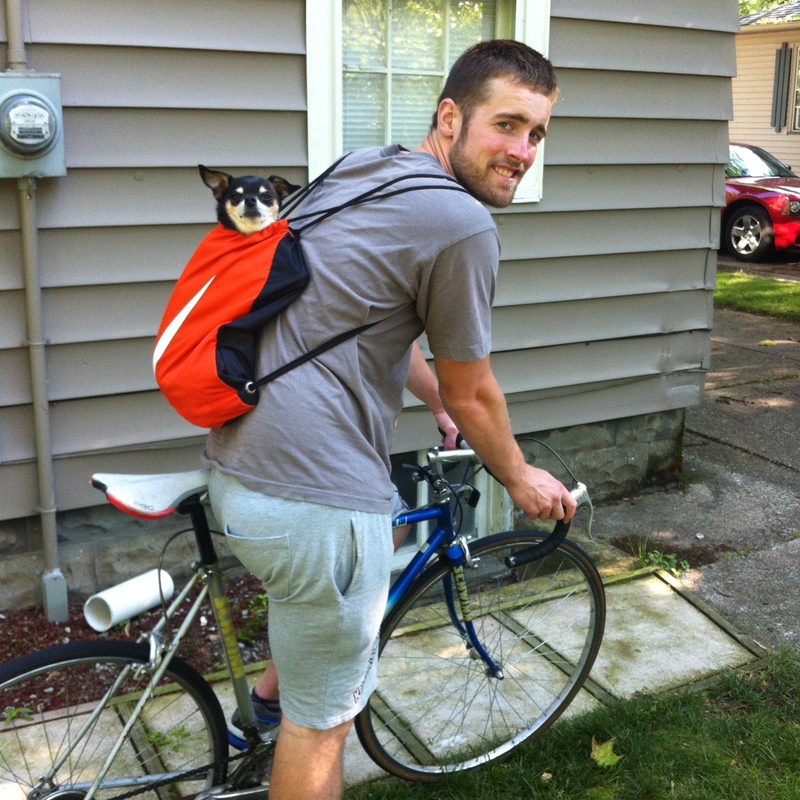 Also, just for fun, here are some more Wheatland pictures from this year, as well as an adorable picture of Simon in Chad’s back pack before a bike ride downtown. 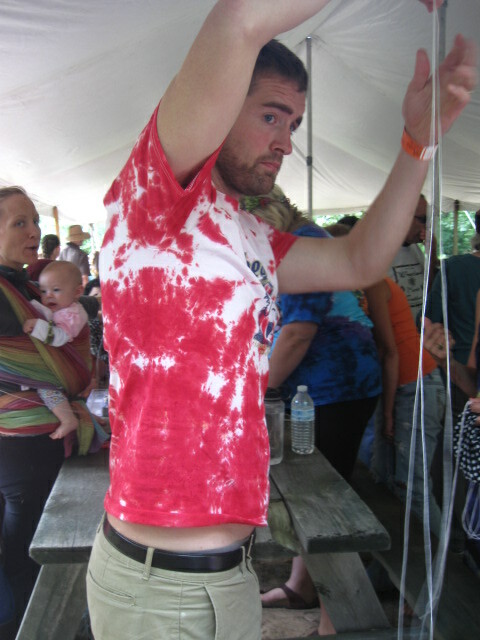 What are some fun things you did over the summer? This morning as a needed distraction, I finally got around to working on one of the writing prompts from 642 Things to Write About. On my summer bucket list, I had hoped to try out at least one writing prompt a week, and today’s attempt was a good reminder that I need to stay in practice! 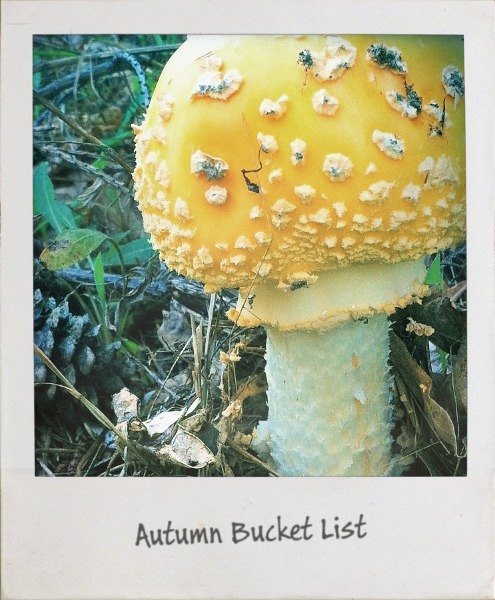 (Perhaps I should add that goal to my Autumn Bucket list this year!) It has been quite a while since I’ve done any creative writing, and I definitely need some brushing up. However, without further adieu, I’ve decided to share what I came up with today here with you. There were six squares in each window pane, and each one could form the perfect picture frame for a scene outside. Eleanor thought about this, sipping her morning coffee and adjusting her viewpoint for each square as though she were looking through the lens of a camera. That little blue house across the road looks just right at this angle, she thought. The simple, cottage-style house fills the right two-thirds of the frame, and leaves the left third of the frame open for the green bushes on the bottom and the arching, yellowing leaves peaking in at the top. Yes, Eleanor nodded to herself, composing a picture in thirds often makes it more interesting. Eleanor slurped her coffee and considered the flavor filling her palate. This morning’s coffee was an autumn blend, matching the fall shadows blanketing the trees outside, the brisk air, and the calm feeling that came over Eleanor every year after summer had passed. With the autumn coffee lingering on her tongue, Eleanor took a bite of a homemade coffee cake scone, closing her eyes and trying to recognize individual flavors: cinnamon, nutmeg, all spice. She had so much time to bake these days. It was something she always loved. She sometimes donated her baked goods to church-related organizations, brushing people off when they tried to approach her and ask her about her delicious recipes. Her nose would crinkle up and she’d hobble away, waving her hands as though she were shooing a fly. It had always been difficult for her to accept compliments, though she secretly loved the attention she got for the things she made. She remembered her grandchildren going wild over her jam tarts when they were little. Each tart would be shaped differently, and Eleanor used several jams as fillings. Apricot, raspberry, blueberry, kiwi…the tarts filled the table like a rainbow. Eleanor smiled as she remembered their tiny little fingers reaching for one tart after another. She lightly touched the smooth surface of the same table the tarts had been spread across years ago, tracing the knots of the wood in several places before reaching for her coffee cup and gazing back outside. Those are new neighbors, Eleanor observed, looking out a different window pane. A young man and woman carried cardboard boxes from a blue station wagon into the quaint red brick house. The woman wore a simple white cotton tee-shirt dress with navy blue leggings and flats, her long strawberry blond hair pulled into a loose pony tail. The man wore jeans, loafers and a three-quarter sleeve plaid button-up shirt. His dark brown hair was a little long and messy, his smile wide and happy. Eleanor shifted her focus to the boxes. The last time she moved must have been thirty years ago or more. What had she brought with her, from place to place? Books, bowls, blankets. Cats, cups, and candles. Usual things, she supposed. Eleanor wondered what would fill the red brick house across the street–what would be neatly unpacked from all of the boxes as the couple made their house a home. She stood from her chair and held onto the wall for support as she made her way closer to the window that framed the young couple moving in. Pushing a stray strand of silver hair from her face, Eleanor squinted outside, trying to make out the faces of the couple. 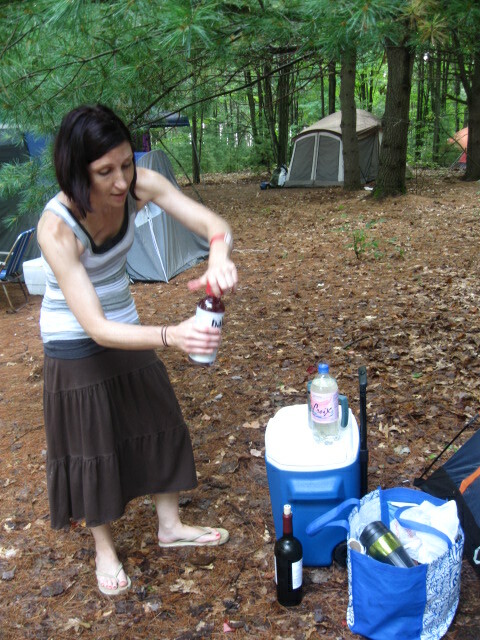 She started, suddenly, eyebrows raised with a look of disbelief. Could that be… No, no. Eleanor had thought she’d seen her grandchildren all over town for years, realizing she was always wrong, always creating an embarrassing scene. It had been so long since she had seen any of them. That’s how life worked, she supposed: over time, people spread out all over the globe and got caught up in life, forgetting about grandmothers. There just isn’t always time for grandmothers. This man across the street looked so much like Noah, her very first grandchild. As she watched him, Eleanor felt a sense hope and comfort in his smile, something familiar in his expression and in his eyes. How would Noah have ended up here, in a house directly adjacent to his old, lonely grandmother? And furthermore, why wouldn’t he have told her, or come to visit? Surely if Noah were to be that close in proximity to his grandmother, it couldn’t inconvenience him much to stop by for coffee. She played the scene out in her mind, imagining Noah giving her a great big hug, saying it’s been so long and does she ever make those tarts anymore? Eleanor shook her head and pulled herself along the table back to her coffee. 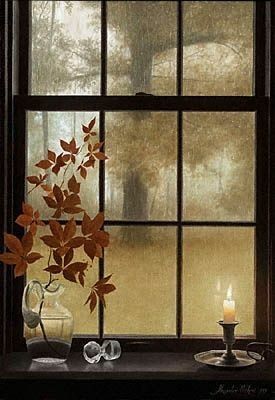 She slid her cup and her plate over to the opposite side, sitting down in front of it with a new view out the windows. It couldn’t be Noah. Eleanor turned her attention to her scone, pushing crumbs onto her fingertips and bringing them to her lips. She squinted up at the blue, cloudless sky out the window. Six new squares to contemplate now, Eleanor thought, and she took another sip of coffee and tried to push Noah from her mind. I love, love, love petit desserts. Lately I’ve been scouring library books for new ideas on petit sweets, and one book that I enjoyed is called Tea and Cookies by Rick Rodgers. I especially enjoyed the introduction to the book, in which Rodgers talks about the history of tea and about different types of tea. For example, tables at tea gardens used to have little locked boxes on them, and if patrons wanted their tea quickly so that it would still be hot, they would drop coins inside. The boxes were labeled “T.I.P.S.,” which stood for “To insure prompt service,” starting the tradition of tipping we know today (although now we tip after the meal). Pretty interesting, huh? 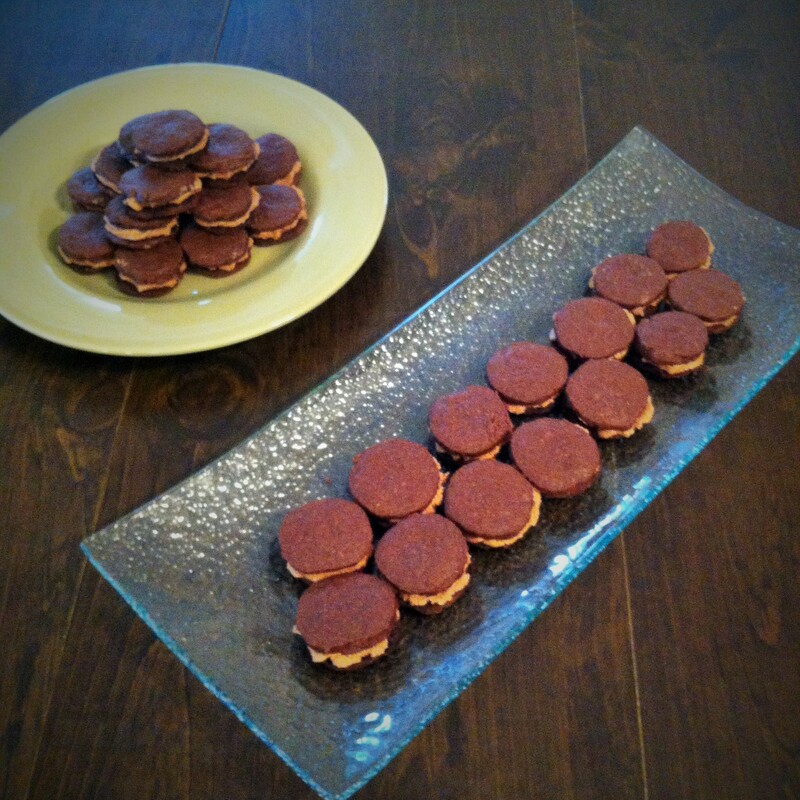 A few recipes peaked my interest in Tea and Cookies, but the one I decided to try first was “Chocolate Sandwich Cookies with Earl Grey Ganache.” My friend Caitlin’s favorite tea is earl grey, and since she recently had her baby, I thought it would be a perfect treat to try to make for her last week. Today was a rainy day so I made them again, thinking they would be perfect for a future tea party! 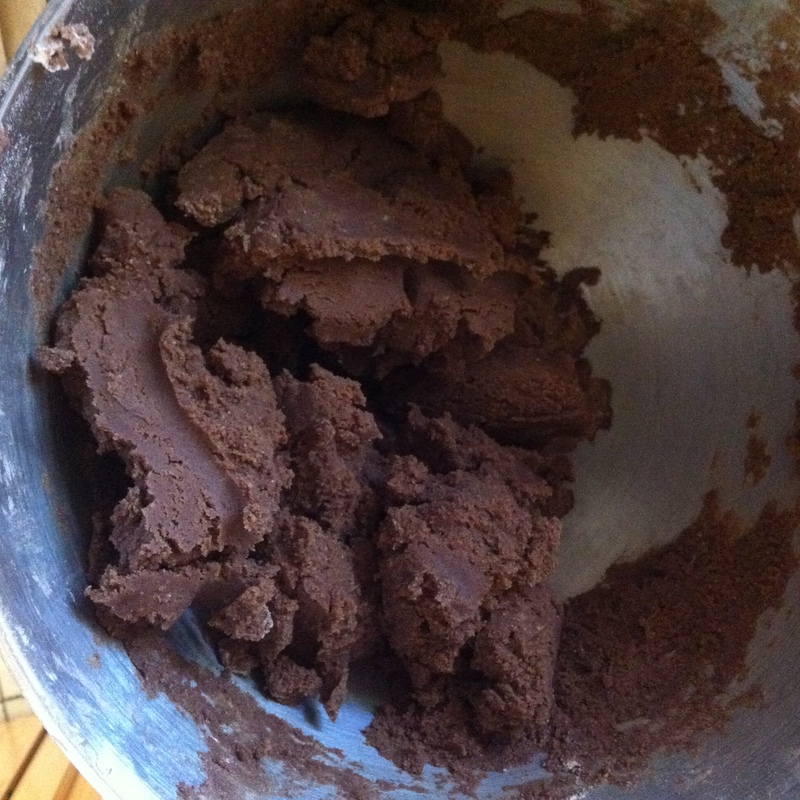 You start by making dough for the cookies, which turn out to be similar to chocolate sugar cookies. 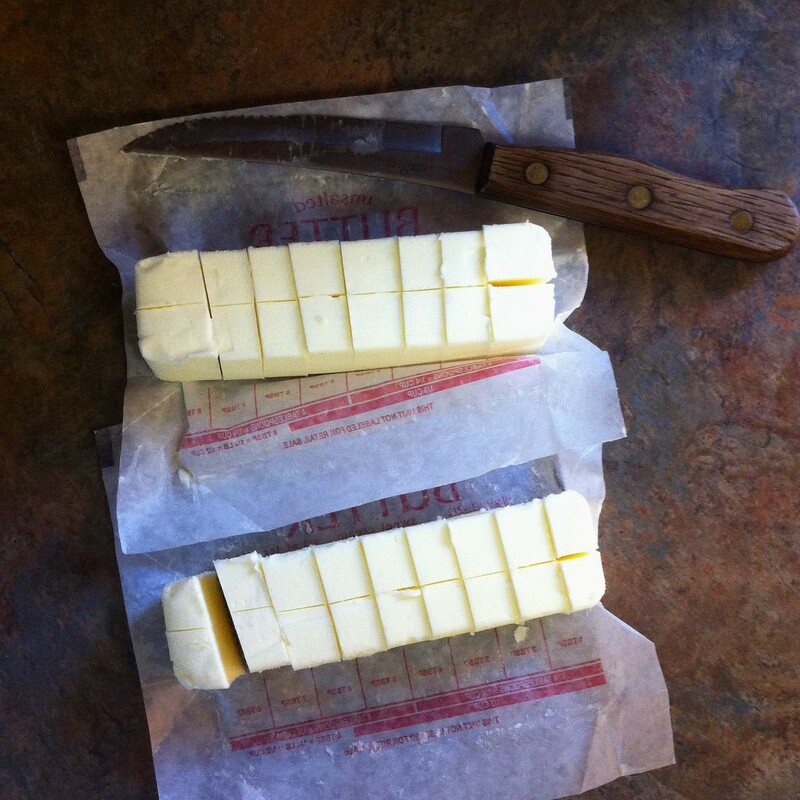 I chopped up my butter in chunks to make it easier to whip up. 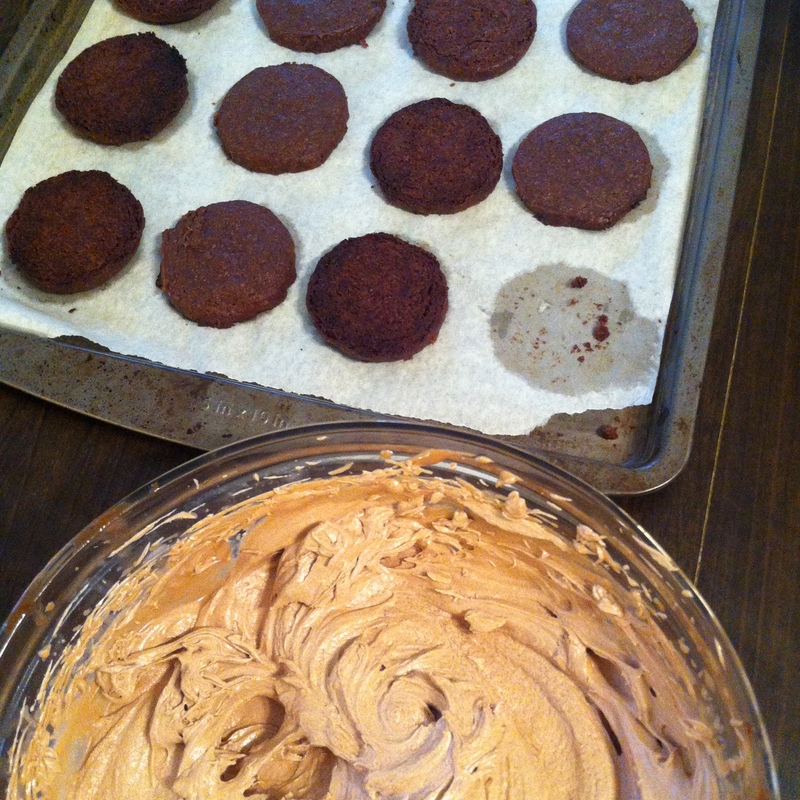 Once you’ve reached a creamy consistency, you add brown and white sugar and beat until fluffy and well-incorporated. 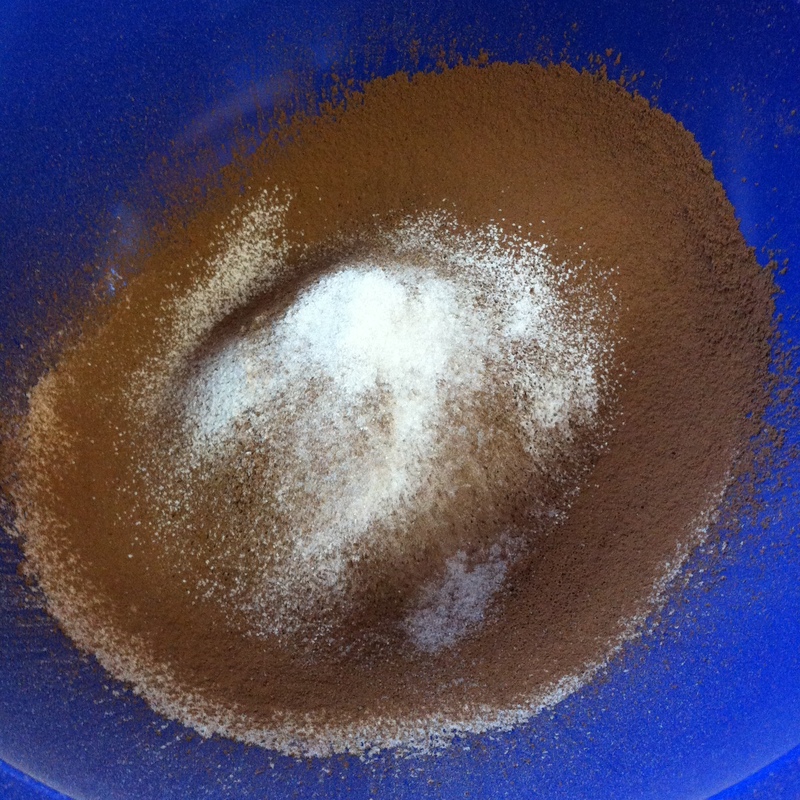 Next up, it’s time to sift together flour, cocoa powder, baking powder and salt. 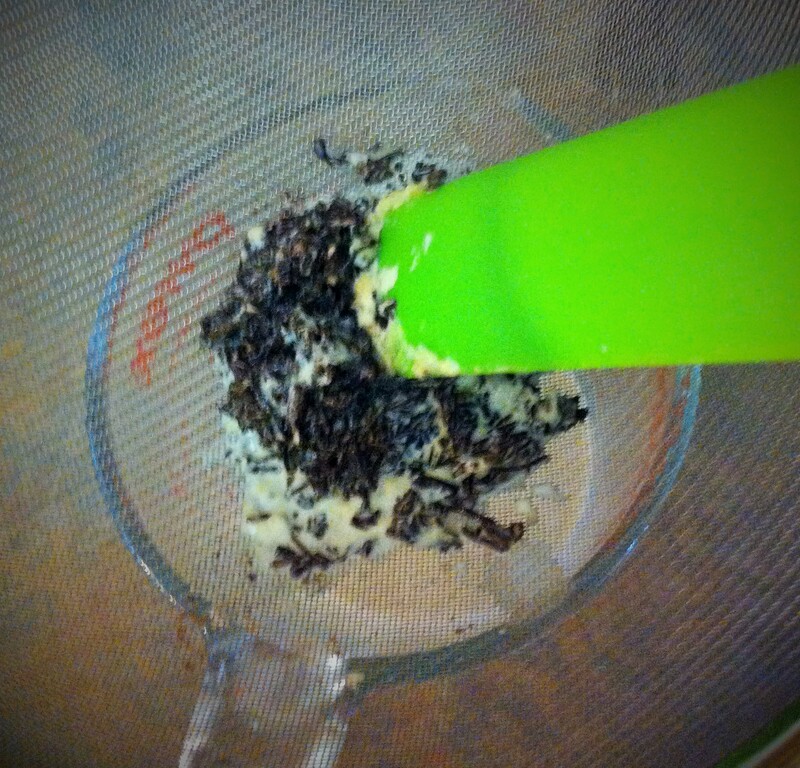 I just love how sifted ingredients look like a sweet, airy pillow! 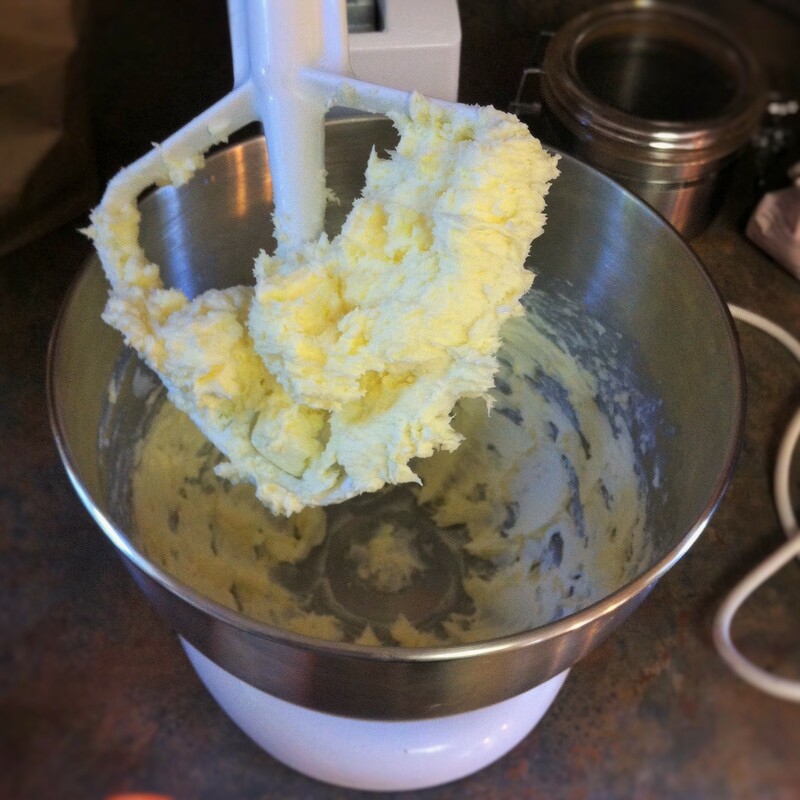 You then gradually add the sifted mixture to the butter and sugar mixture until it becomes a dough, and then roughly shape it into a log. 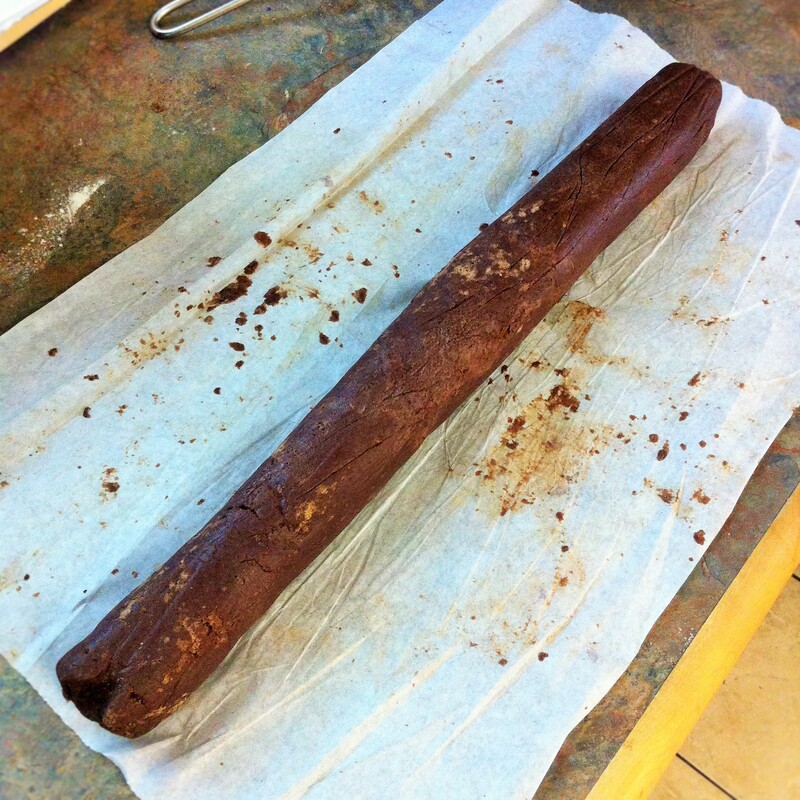 I used parchment paper to help roll the log into more of an even shape, rolling it over the counter to make the dough smooth. Once you’re happy with your dough, cut it into three equal slices and refrigerate for 2 hours or up to 2 days. The first time I made this recipe, I was in a bit of a time crunch and just froze the dough for about 30 minutes, and I got the same results. Once your dough has been cooled in the fridge or freezer, cut 1/4″ slices and lay them an inch apart on baking sheets. 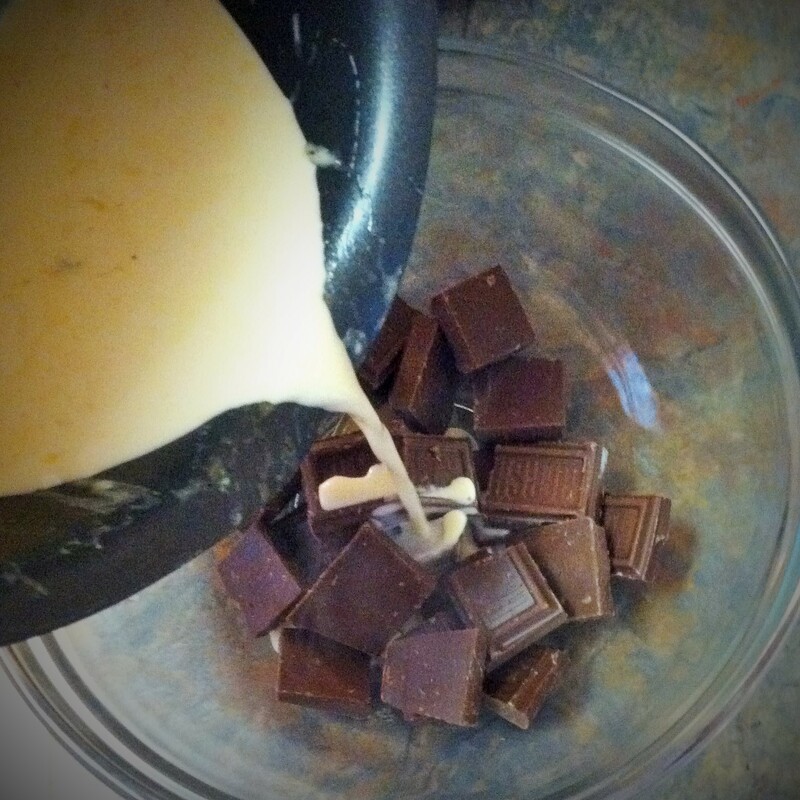 While the cookies are baking, you can start working on the ganache. 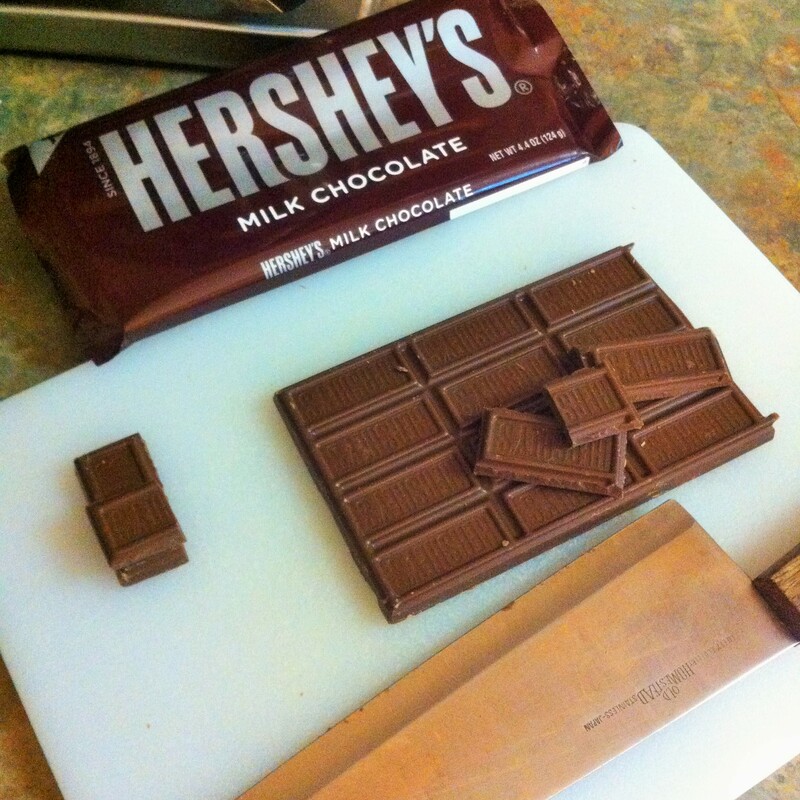 The recipe calls for 4 ounces of milk chocolate, so if you’re using a Hershey’s Milk Chocolate Bar, you’ll want to remove about a square and a half from the 4.4 oz bars to have the correct measurement. You should probably eat those extra pieces, just to make sure they don’t go disappearing elsewhere on you. 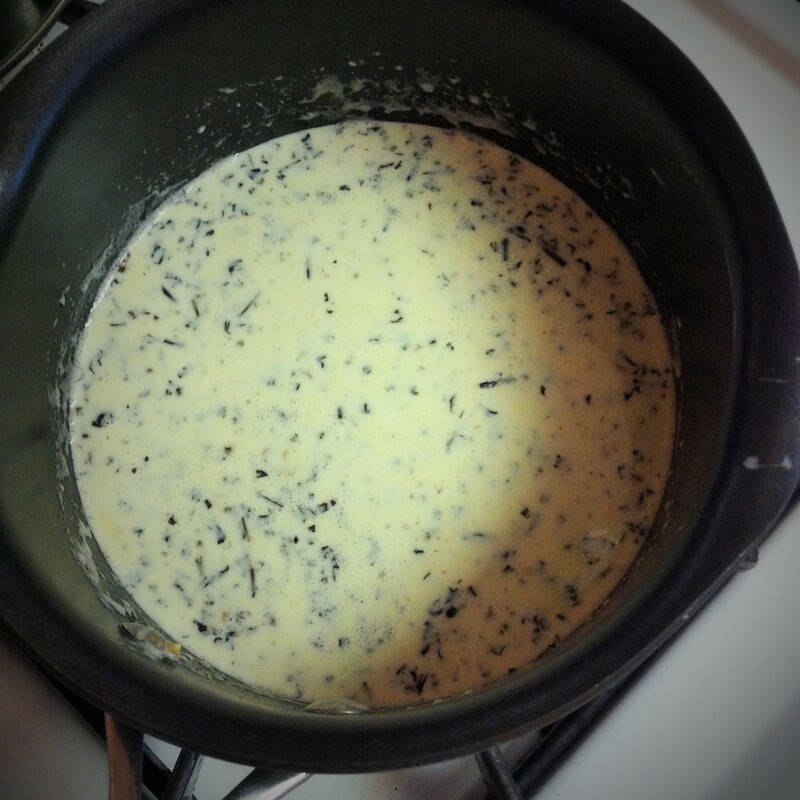 To make the ganache, you first you bring heavy whipping cream to a simmer on the stove top… …and then you turn off the heat and add earl grey tea, letting it simmer for 5 minutes. Next you strain the tea, pushing down on the leaves… …and then you bring the cream mixture to a simmer again before adding it to the chocolate and mixing until smooth. 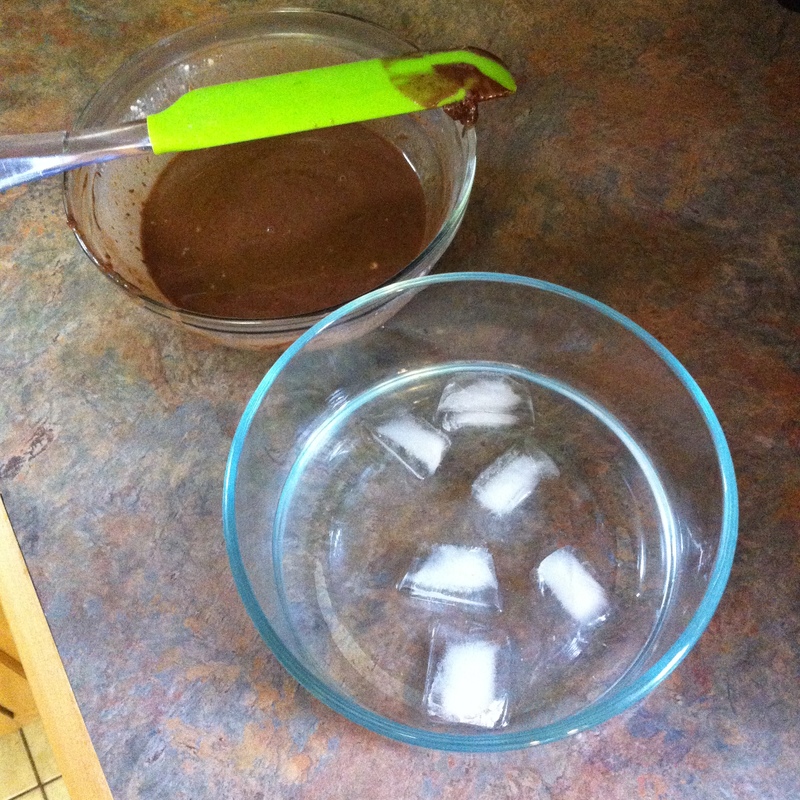 Once the mixture is smooth, it’s time to put the bowl over another bowl with ice water so that you can whip it into a ganache. I think I may have over whipped my ganache, so the color was lighter than I thought it would be both times I made it, but the flavor was still really nice. Someone thought he was tricky and stole a cookie! 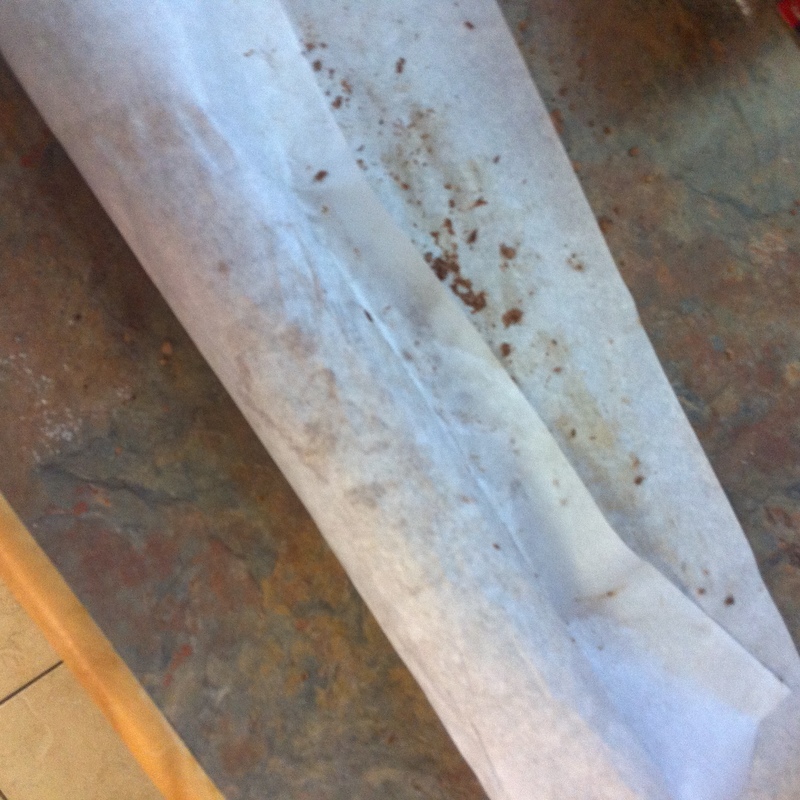 That naughty, naughty Chad… Pipe or spread the ganache on half of your finished cookies, and gently sandwich them together. Then, enjoy! I love how pretty these cookies are, and also how wonderful the balance of flavors plays out in the recipe. 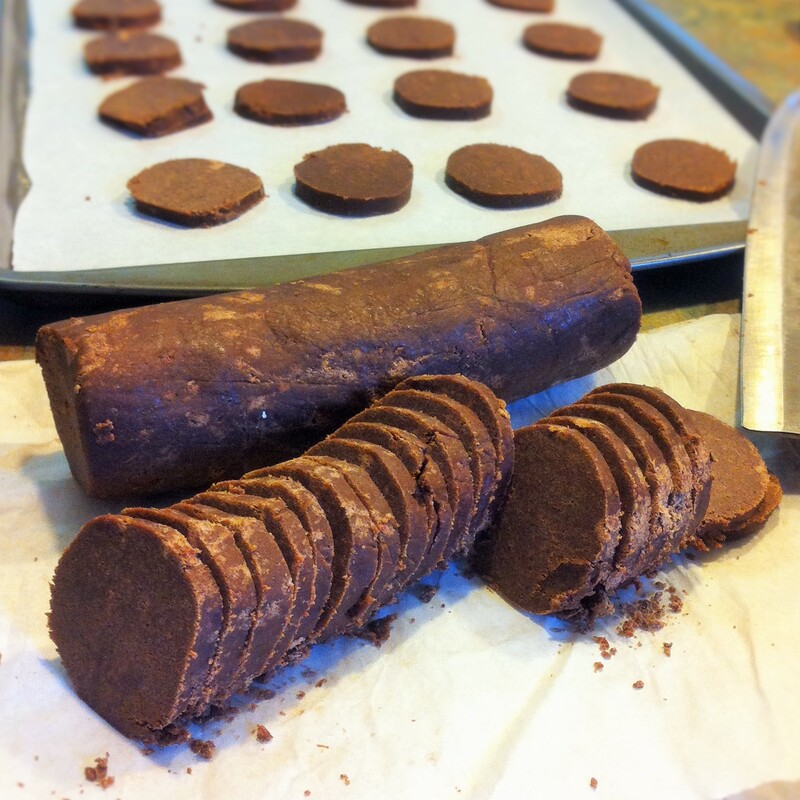 The earl grey notes in the ganache brighten up the richness of the chocolate cookies with a subtle, yet bright citrus flavor. 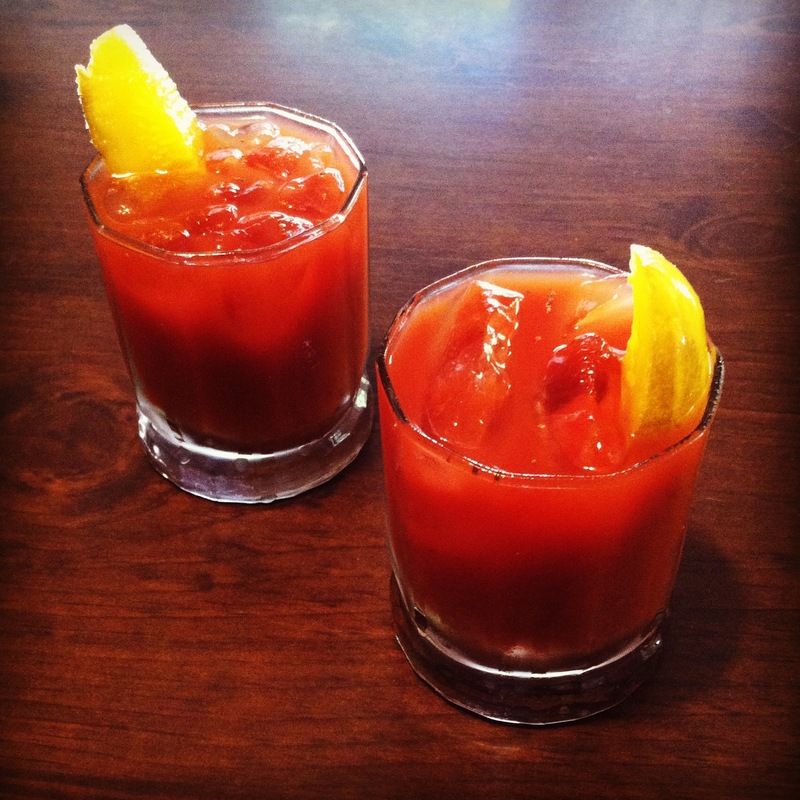 I think pairing these with a straight tea (like earl grey, perhaps!) or coffee would be just divine. 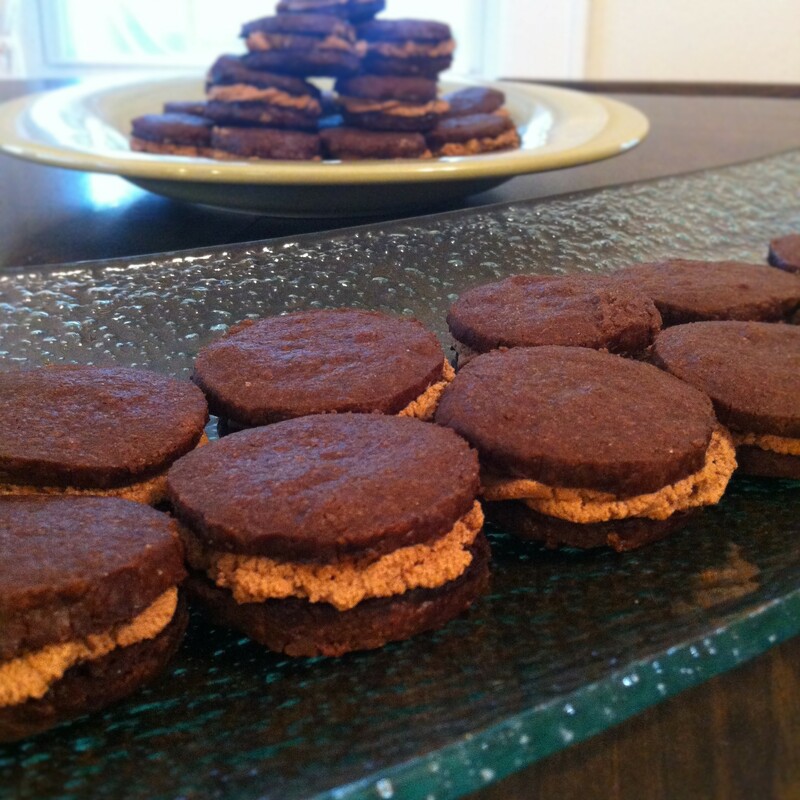 You can find the full recipe for the cookies here on the Rick Rodgers website. Now that I’ve enjoyed Tea and Cookies by Rodgers, I’m interested in looking at some of his other books, such as Kaffeehaus: Exquisite Desserts from the Classic Cafes of Vienna, Budapest and Prague. What are some of your favorite pastries and pastry books? 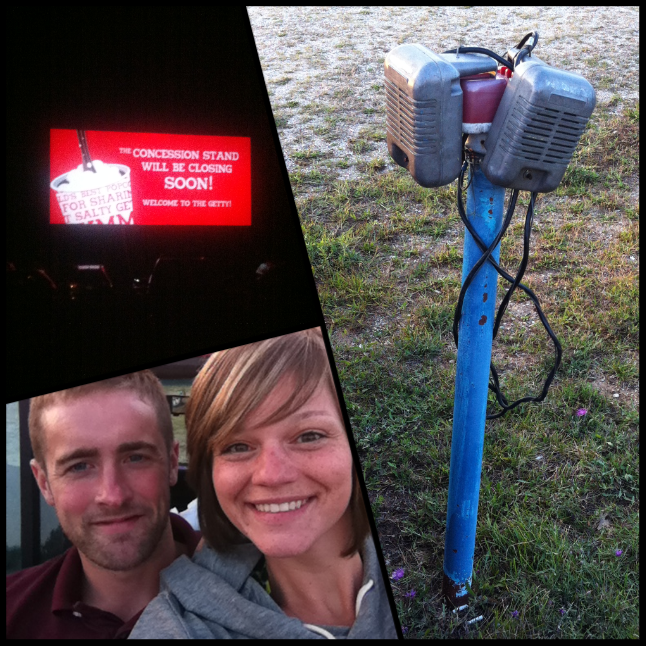 A couple of weekends ago Chad, Caitlyn, Justin, our friend LeeAnn and I went to Wheatland Music Festival. 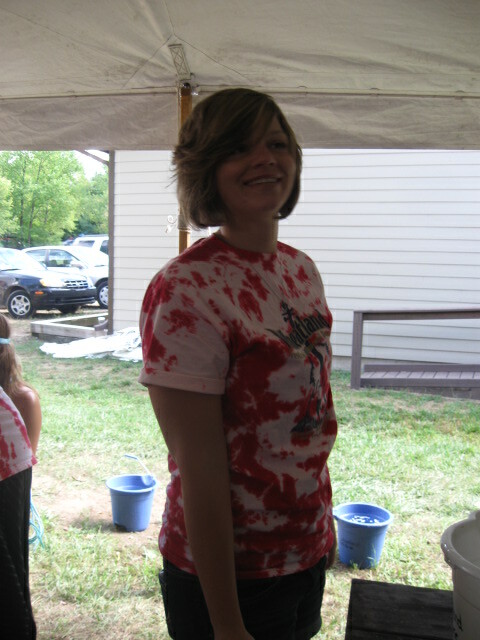 I’ve been going to Wheatland almost every year of my life and it is definitely one of my happy places. 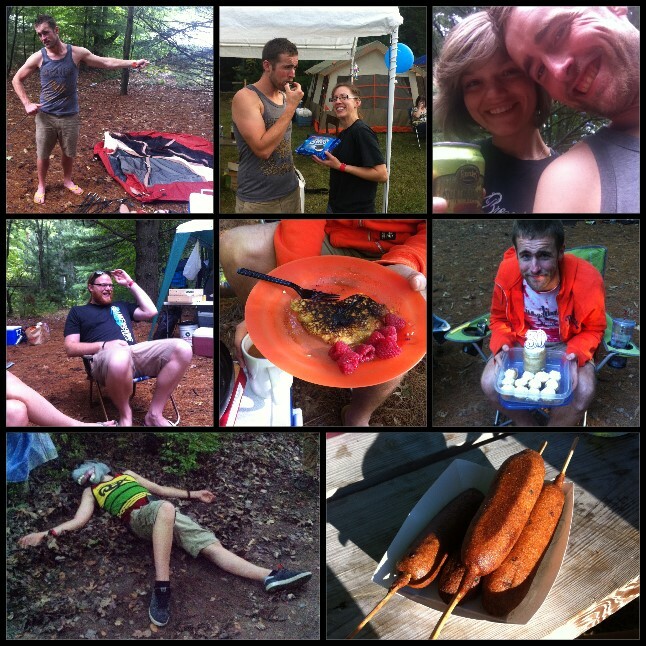 There’s good music, great food, and fun times with friends. Caitlyn posted about Wheatland last year so you already know about the gloriousness that is blueberry pancake sausage on a stick. Unfortunately, I didn’t take as many pictures as I wanted to. 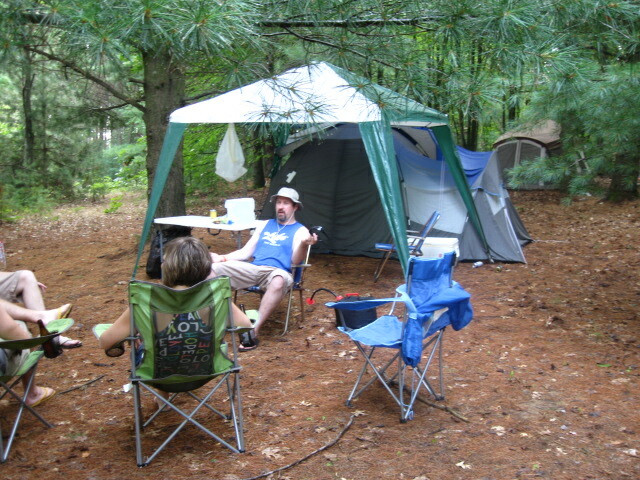 I was having too much fun to remember to bring my camera with me whenever I left the campsite. isn’t that a beautiful face Caitlyn is making? 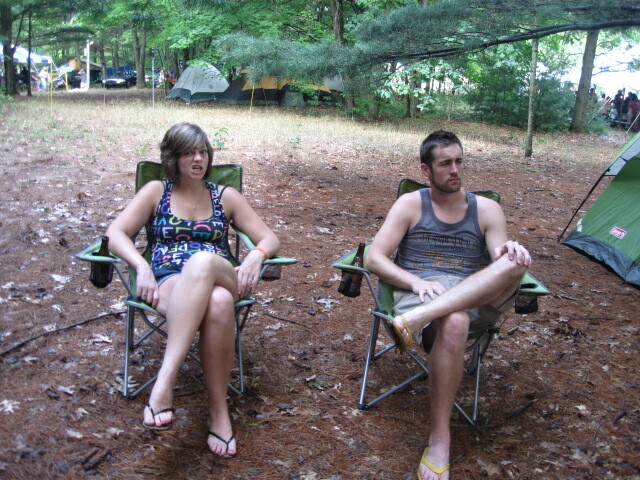 here’s my parents. 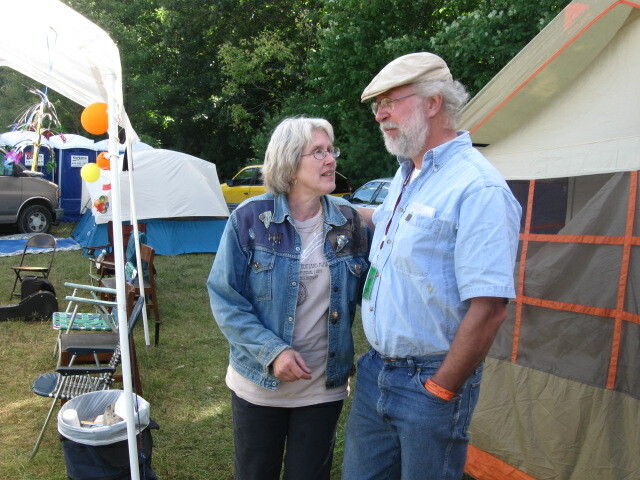 they’ve been going to Wheatland for 30 some years. It’s hard to find the right words to describe the conversations we had (that would not be nearly as funny to anyone who wasn’t there as they were to us) and the irritation you feel upon being woken up for the fourth time in one night because the drum circle is still going strong or a group of 15 people have broken out in song. 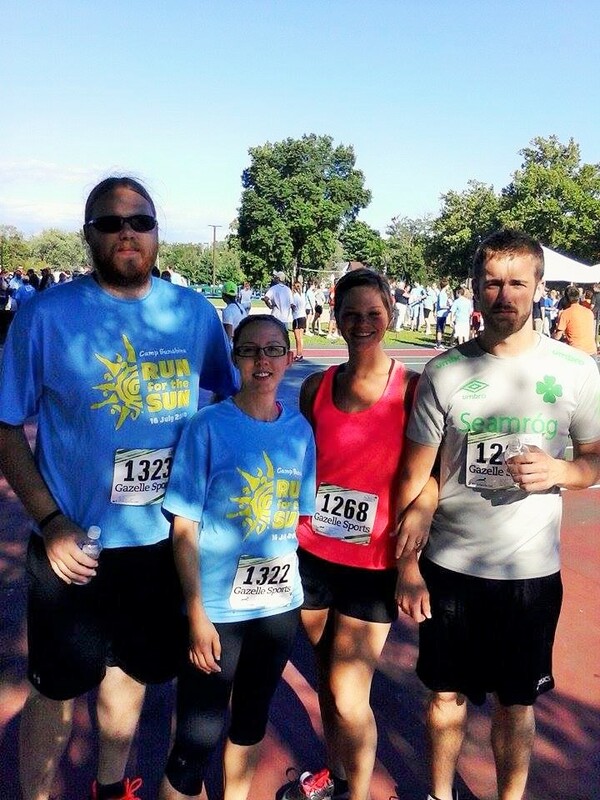 Despite not sleeping well, we had a fantastic time. It’s always hard to leave at the end of the weekend. 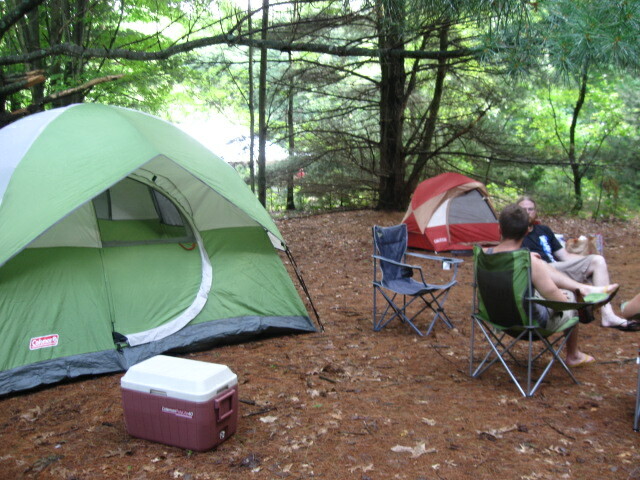 You want to stay and continue to have a great time with your friends, camping in the woods, eating awesome food, and listening to really talented musicians. 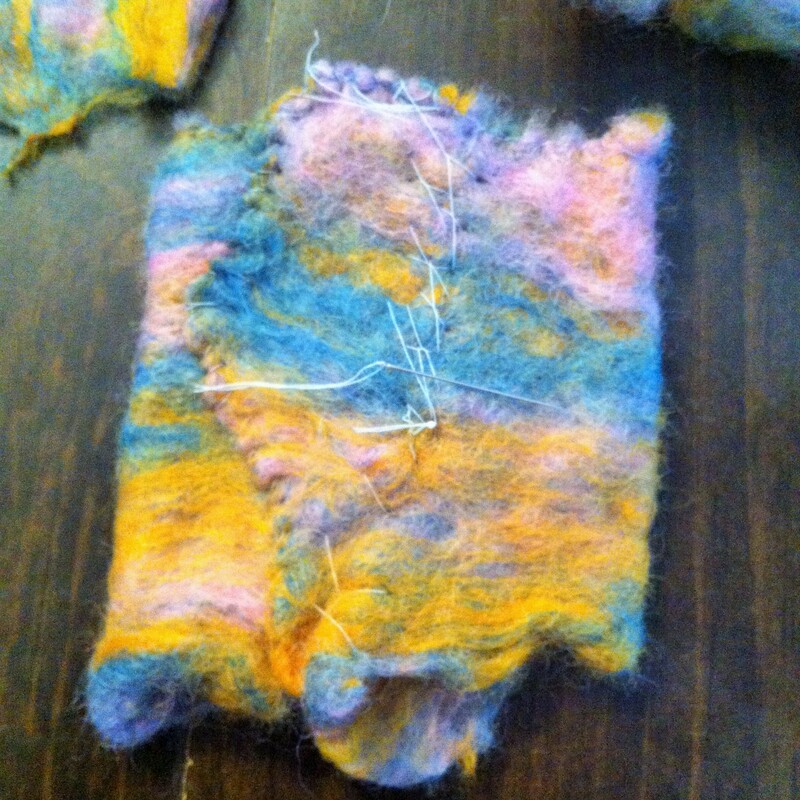 Last weekend at Wheatland I volunteered to help with making felt purses. 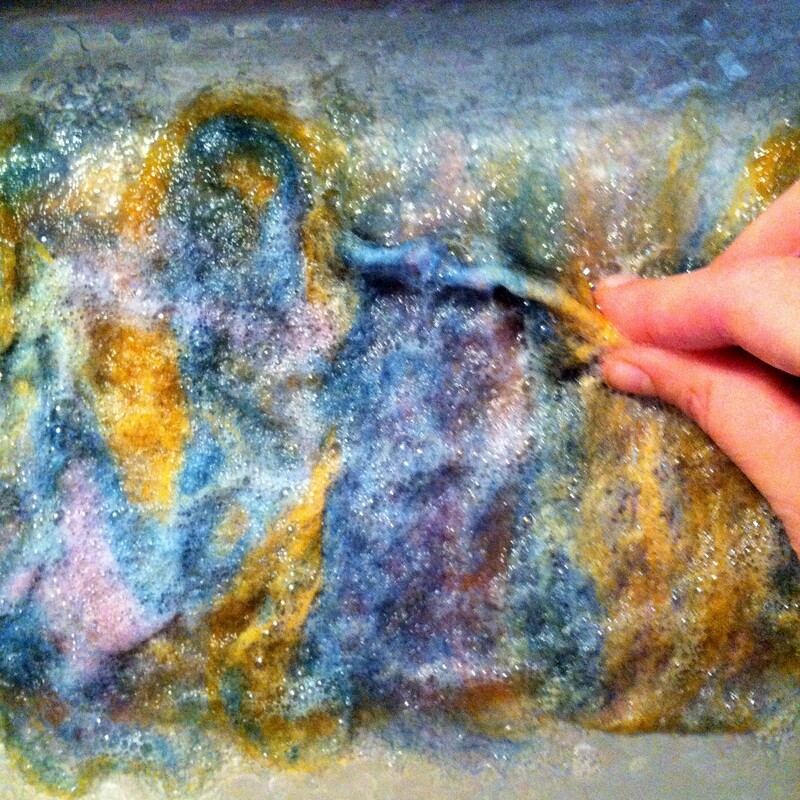 Although I’ve had lots of fun working with needle felt, I never tried felting with water, so I was interested to learn how it worked. 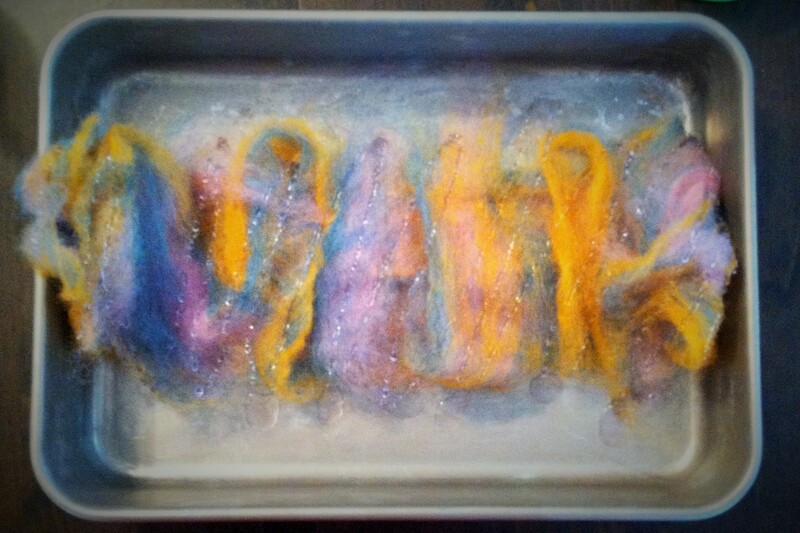 Turns out, felting with water is pretty easy, though I can’t see myself making loads of things in the style. 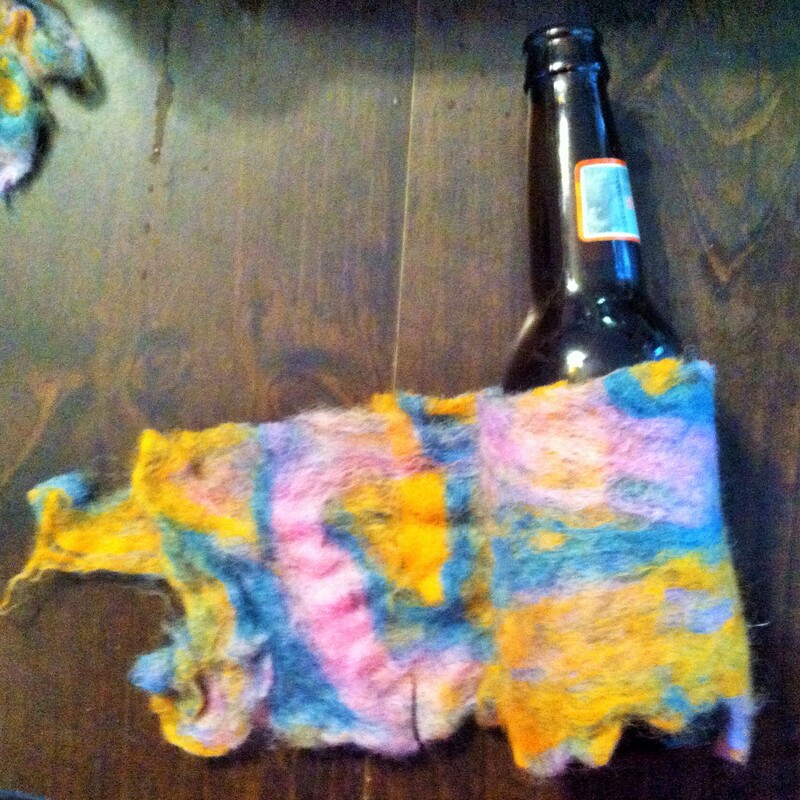 One thing I did venture to make, however, was a beer koozie. Of course. 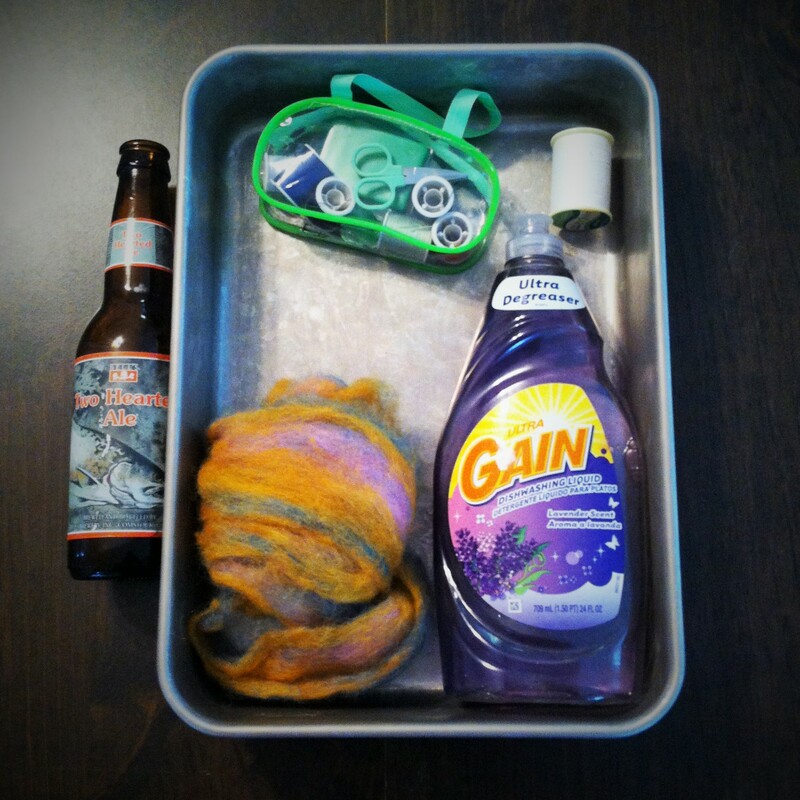 So above are the necessary materials you need to begin: a bottle or can for sizing reference, a pan at least an inch or two deep, needle and thread, dish soap, and wool in the color(s) of your choice for felting. 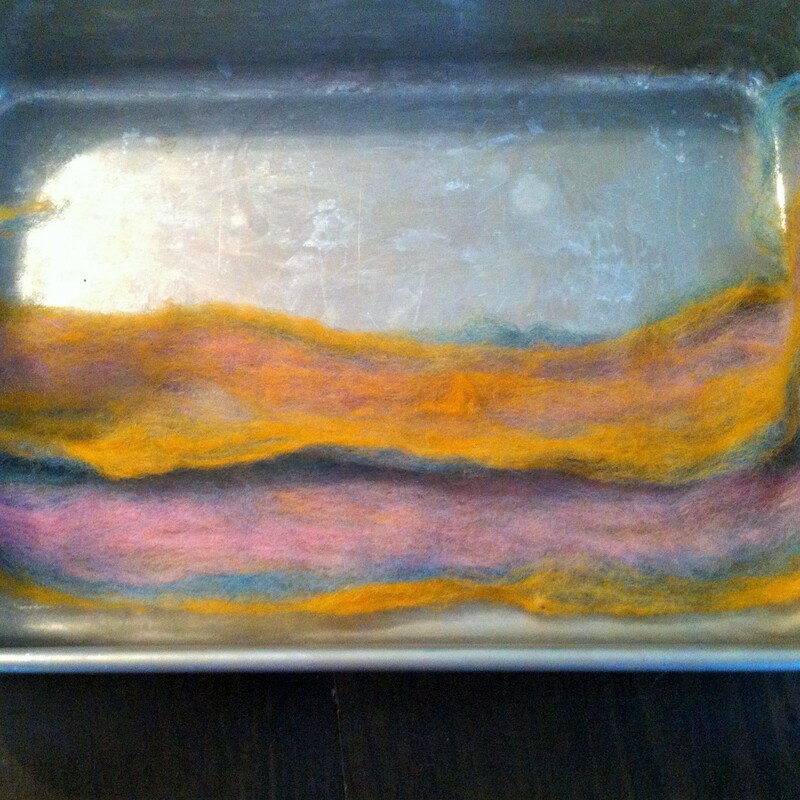 Begin by separating the felt into two layers in your pan. 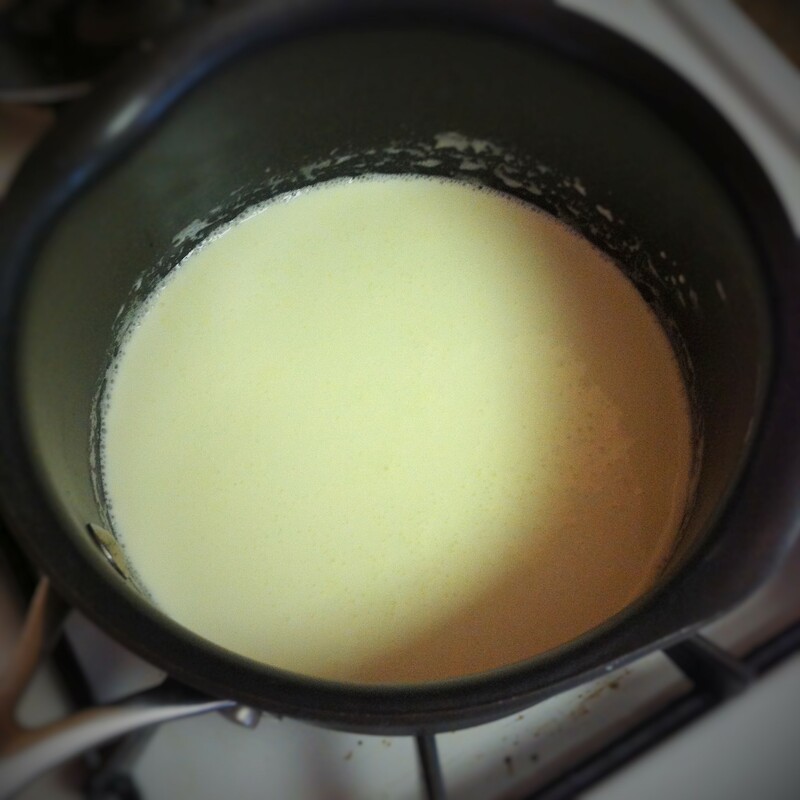 The first layer should go across the width of the pan, and the second layer should go up and down, in the opposite direction. This ensures there won’t be any thin areas in your project, and helps prevent holes in the end result. 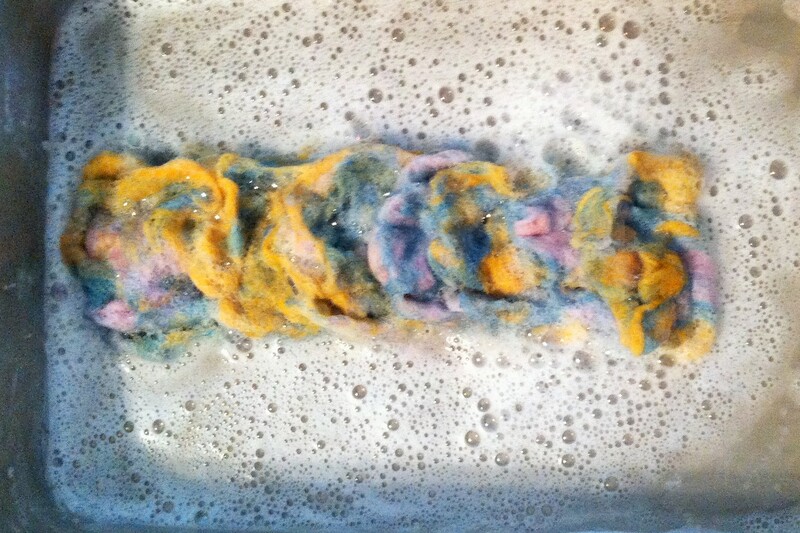 Once you’re satisfied with your layers, drizzle dish soap over the prepared felt. 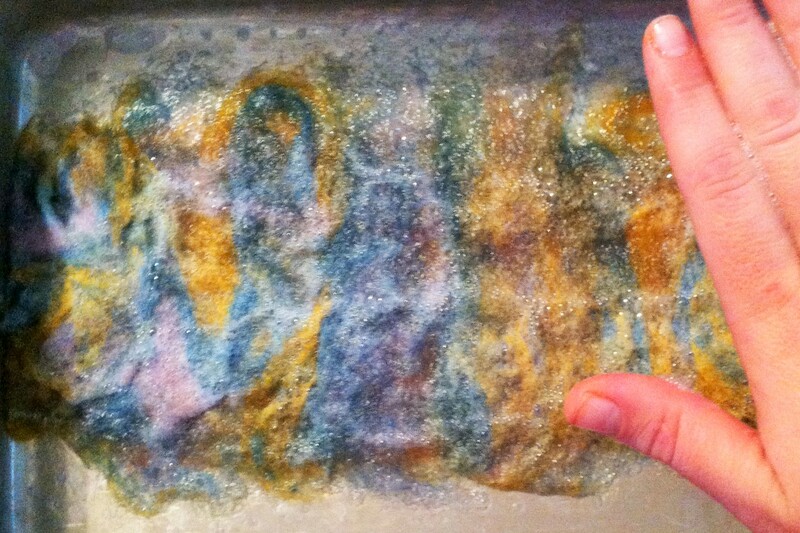 Next, add some water, just to cover the felt, and press it down like a pancake using the flat of your hand. 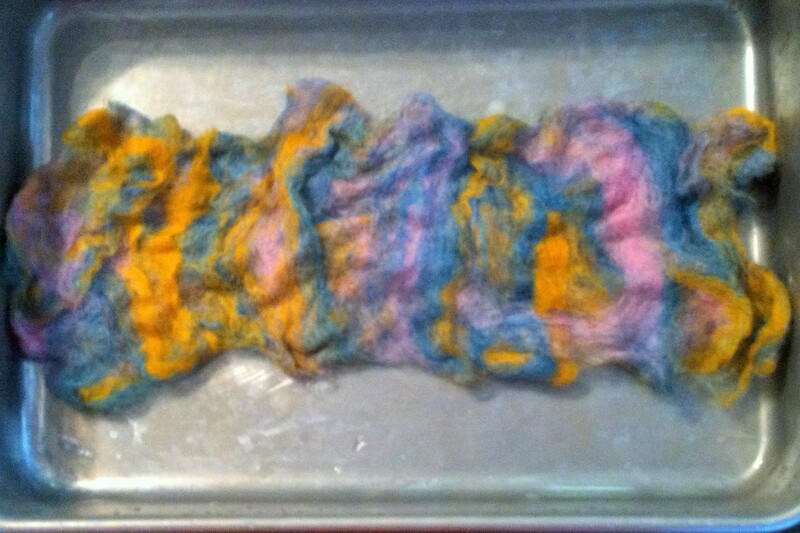 The next step is pinching the felt together like a pie crust, all over. 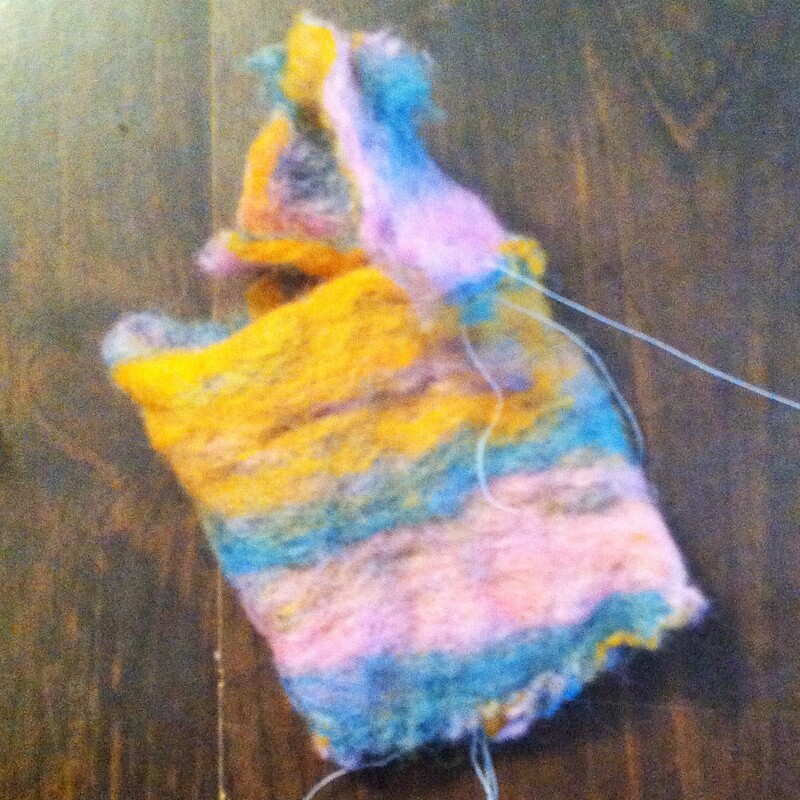 Once you’ve pinched for about five minutes, you’ll flip the felt over and repeat the pinching on the other side. It should take around 10 minutes, if you have the patience. 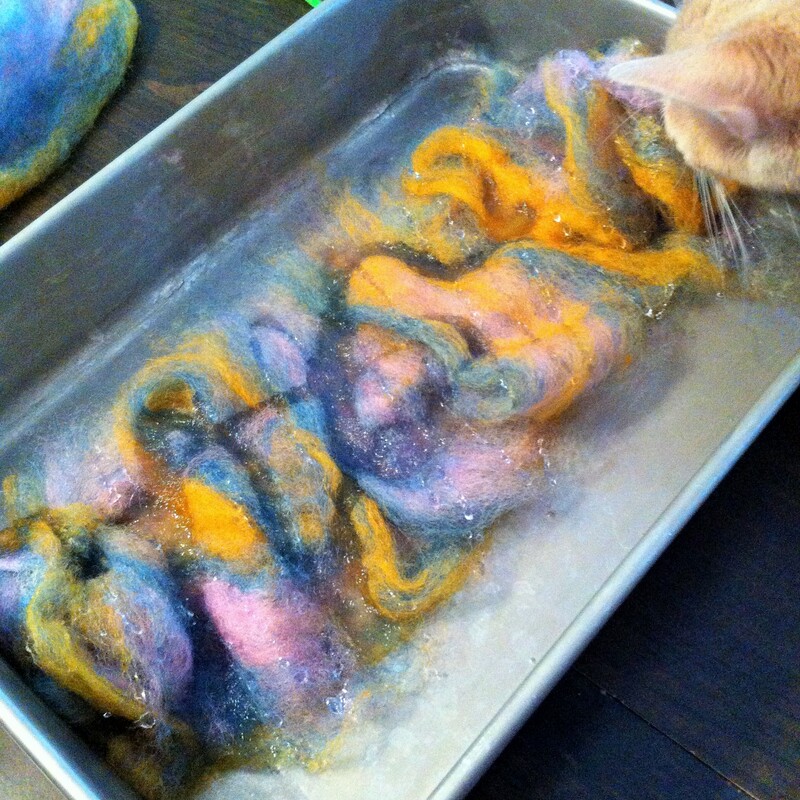 Once you (and your cat, if applicable) are satisfied, it’s time to rinse out your felt. 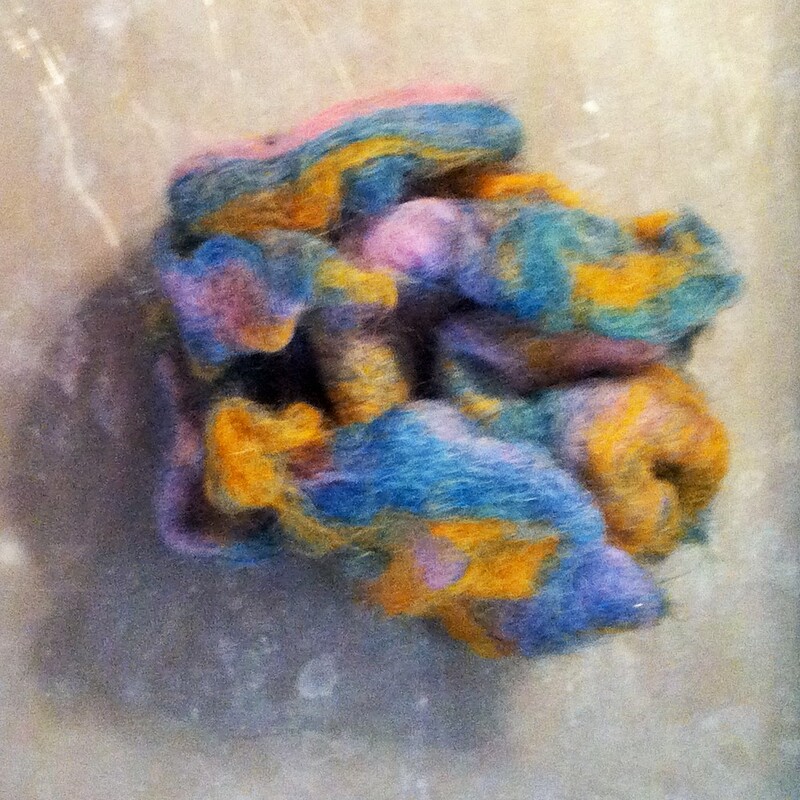 Here is my ball of felt after washing. 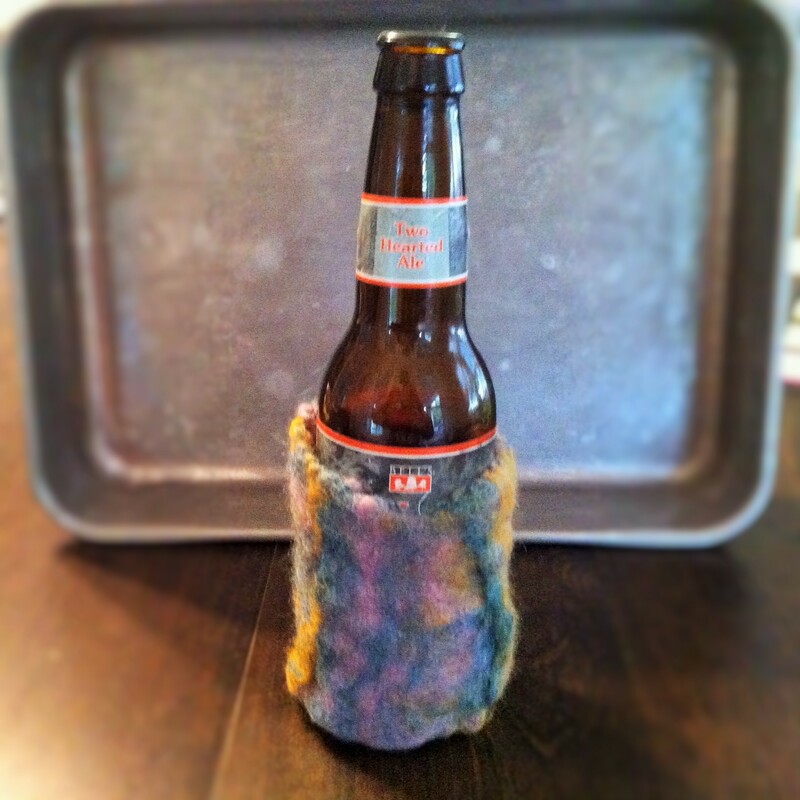 Roll out your felt and place a bottle or can on it to measure your Koozie. I measured the width first, and then measured out a circle for the bottom. 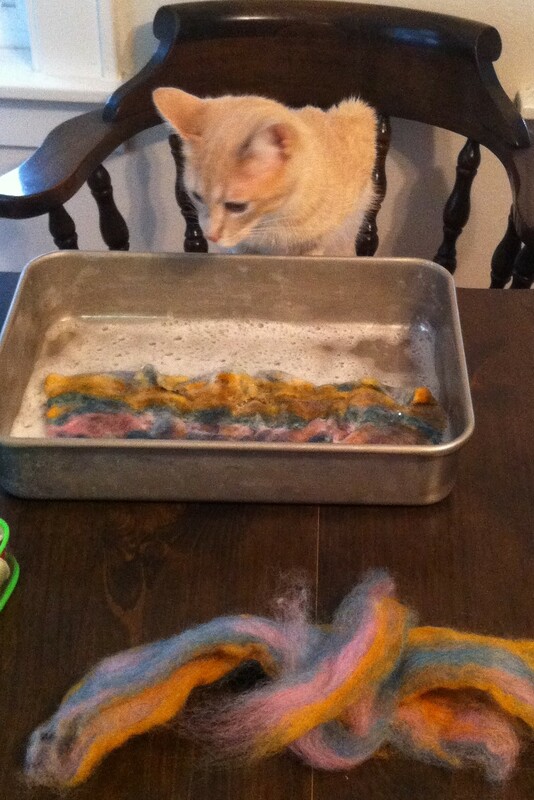 Next, sew the edges together. I did a bit of a hodge-podge job on part of it, but I didn’t worry too much as I knew I’d be turning the koozie inside out when finished. A big part of this project was not worrying about perfection. 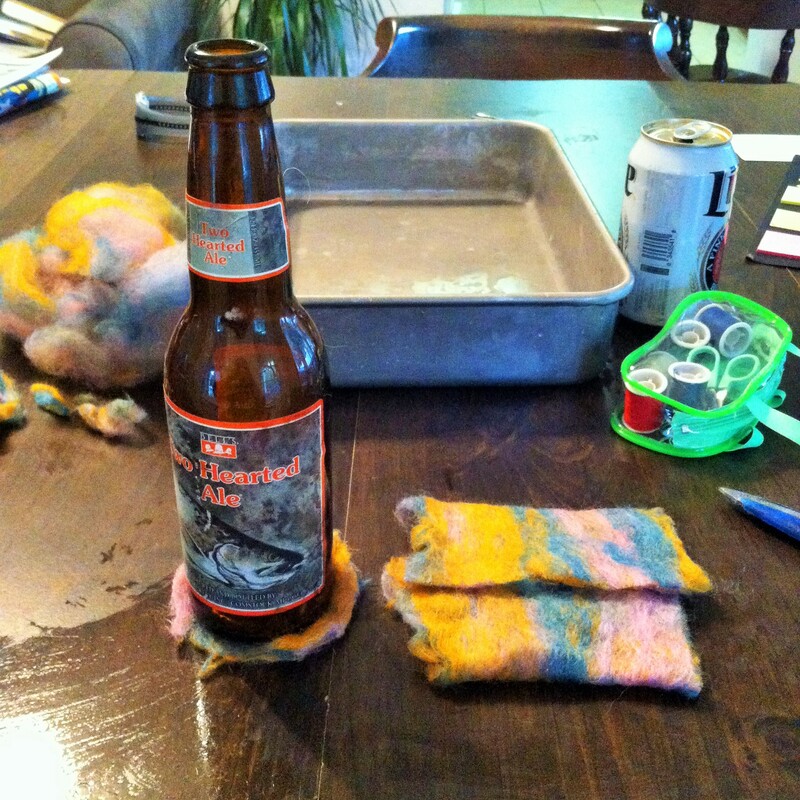 Next up, you can sew on the bottom of your koozie and inspect your work! 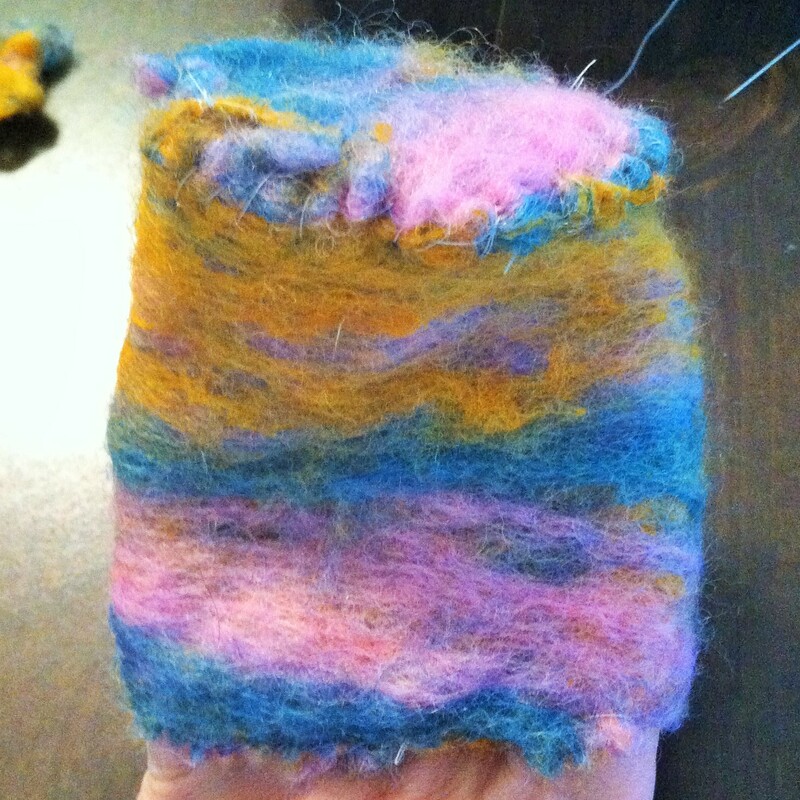 Here is my completed koozie before turning it inside out. Do you like the wet-felt method? 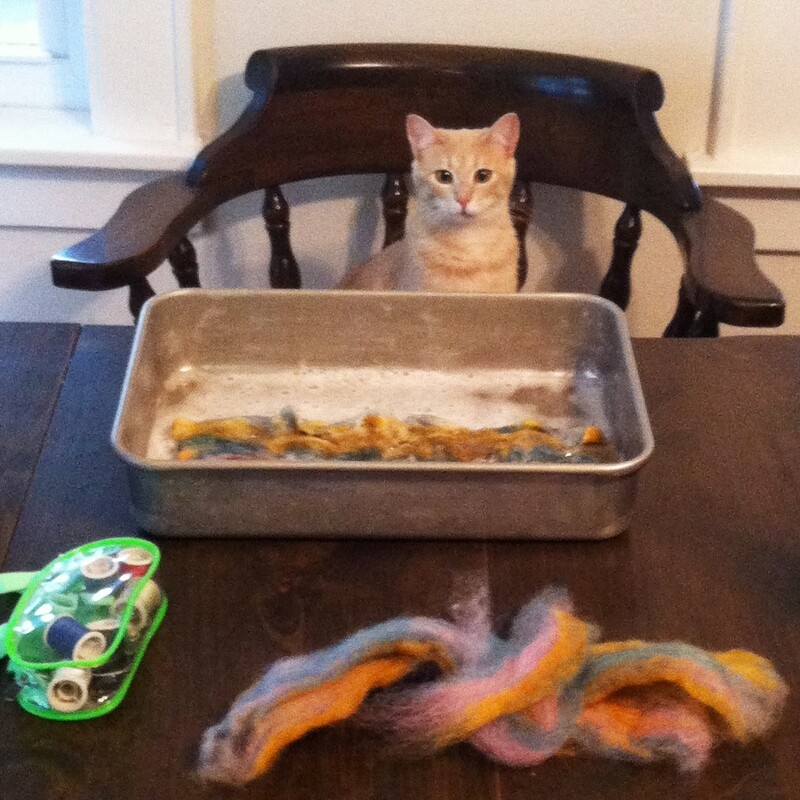 What kinds of felt projects have you made or would you like to make in the future?